Has Microsoft yanked last week’s Win7 Monthly Rollup, KB 4462923? It’s still in the Microsoft Update Catalog, but I’m seeing more and more reports that it’s not available through Windows Update. I wonder if this has anything to do with the dumb SSU bug I wrote about yesterday? Home › Forums › Has Microsoft yanked last week’s Win7 Monthly Rollup, KB 4462923? This topic contains 67 replies, has 23 voices, and was last updated by anonymous 5 months, 4 weeks ago. Just checked one of our machines set to check updates but not install. 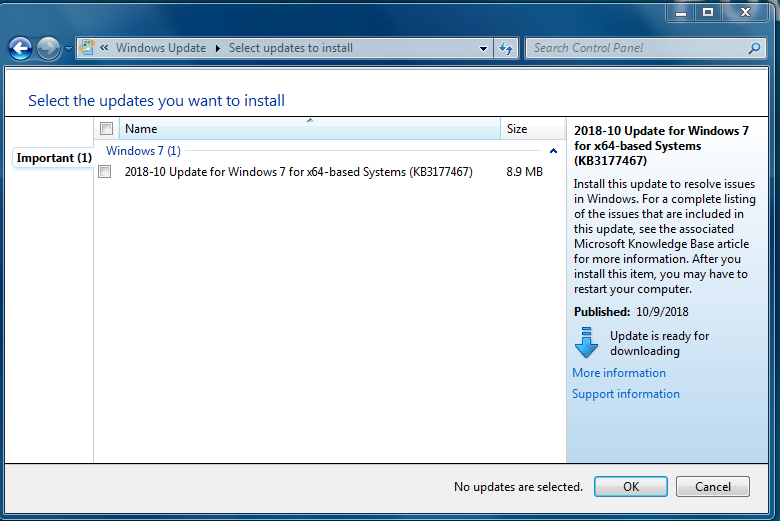 KB4462923 was listed as important update and ready to install. After hitting check for updates it was removed and KB3177467 was the only update available. New version of KB3177467, referred to here as KB3177467-v2, is now available. Whether or not the new version is necessary is open to speculation. We are at DEFCON-1 and patches are yet young. Wait to patch. Just ran WU and KB4462923 is showing but the box is unchecked. KB4462923 was checked yesterday and hidden but when I did a restore it came back in as unchecked. Do I hide it again or leave it in the queue? On my Win 7 Pro 64-bit, on WU, there were two updates listed, but I re-checked for updates and one of them disappeared. 8:25am in NYC. Hey – when I re-checked for updates this morning on my Win 7 Pro 64-bit machine, and the number of updates changed from two to one, I didn’t realize it, but in fact BOTH updates had disappeared and were replaced by “2018-10 Update for Windows 7 for x64-based Systems (KB3177467)”. I will run that now. I want my service stack to be like a greased pole. But if you never hear from me again, you’ll know I bought an Apple. Ran KB3177467 and still alive. On a re-boot and re-check, only one of the original two updates is now showing, and it’s “2018-10 Security and Quality Rollup for .NET Framework 3.5.1, 4.5.2, 4.6, 4.6.1, 4.6.2, 4.7, 4.7.1, 4.7.2 for Windows 7 and Server 2008 R2 for x64 (KB4459922)”. But not doing no nothing until we get to DefCon 3. In my case, KB4462923 has gone to Important and unchecked. I’ve already hid the .Net rollup which came out initially as Important but unchecked. I wonder if KB3177467 V2, the SSU update, is necessary to install if you already have v1? My W7 laptop which is set for check but don’t download or install had it pending. Did a check for updates and it’s now gone. I don’t see any issues with KB4462923 & KB3177467 V2. KB3177467 V2 has been not offered by Win7UC at all in my case, and then downloaded from m$ catalogue and installed manually prior to install of KB4462923 thru win7 update center. A good point is that you don’t need to remove KB3177467, if installed earlier, before an install/update KB3177467 V2. Win7 accepts its straight install right over the previous version installed. It’s tested on 2 win7sp1x64 laptops + 1 desktop on Tue & Wed w/o any glitch. P.S. All 3 win7sp1x64 above are built/updated w/o KB3125574 – Convenience rollup update. KB4462923 was on my Windows Update yesterday, now today it is gone. Speculating it was pulled due to potential problems? Question for Woody….if you already have the SSU update KB3177467 installed, do you see a reason to install KB3177467 v2? Another poster has said you can install v2 over it if deemed necessary. I don’t know of any reason to install it. All of my Win7 computers have had KB3177467 v1 installed since October 2016. Yesterday I manually installed KB3177467 v2 on my primary Win7 computer. V2 installed just fine, replacing the previously installed v1. This morning I decided to see how Windows Update presented updates on one of my Win7 laptop computers. Windows Update showed that the October Rollup and the October .NET updates were available. After I hid these two updates and did another check for updates, only then did Windows Update offer KB3177467 v2. I also wanted to see if I would encounter any issues of installing v2 over v1 via Windows Update. Windows Update installed KB3177467 v2 over v1 without any issues. I then reviewed the details for this installed update in the Windows Update history. The details do mention that you may need to restart your computer for this update to take effect. I am pretty sure that this restart requirement only applies if you did not already have v1 installed. Given that I already had KB3177467 v1 installed and that Windows Update offered the October updates, it does not appear that it is necessary to install KB3177467 v2 — at least for the time being. It is possible v2 could include tiny tweaks to the servicing stack code, yet I really don’t think so or otherwise I would have been asked to restart my computer in order to apply the update. neccessary or not, what difference it make not to install it? KB4462923 was on my Windows Update yesterday, now today it is gone. Speculating it was pulled due to potential problems? Check Programs and Features >> View installed updates and see if you have the original KB3177467 installed. I suspect that you do not have it installed. Do another check for updates in Windows Update and see if KB3177467 v2 now shows up in Windows Update. Both yesterday and this morning, I un-hid KB4462923. KB4462923 did not disappear in Windows Update after un-hiding it. This may be due to the fact that I had the original version of KB3177467 installed. I have now installed KB3177467 v2 on my Win7 computers. I just repeated the same test of hiding KB4462923, checking for updates, and then un-hiding KB4462923 and again checking for updates. KB4462923 did not disappear. My guess is that Microsoft changed the installation logic to offer KB4462923 only if KB3177467-v2 is already installed. Or they temporary removed KB4462923 to give users some time to install KB3177467-v2 before offering KB4462923 again later. Checked yesterday and it was there along with MSRT. Today only the MSRT shows up. I have KB3177467 Sept 2016 installed. It was installed in September 2016. Yesterday all the October updates from windows update were there from windows update for install, but as a Group B installer I usually let them sit there until I install the Security Only updates from the catalog. After that I hide the monthly cumulative update. I always wait for the same reasons that every other consumer does – I refuse to be a beta tester. Today, I received the October 2018 updated version from Windows update, but all of the updates that were there yesterday have gone. That includes net, monthly updates and the removal tool. So, Microsoft is insisting that the October version of KB3177467 be installed even if you have the September 2016 version installed. Do we obey? We are at DEFCON-1. That means WAIT TO INSTALL. You should not install ANY October updates at this point. Unless for sport, of course! Some are like bugs drawn to a light, unaware of the high voltage grid around it waiting to zap them. I have had no issues after installing KB3177467 v2 on all of my Win7 computers. aboddi86 is correct that v2 adds nothing new, other than being re-flagged as a security update. I liked @speccy‘s approach. This demonstrates clearly the number 6.1.2.5 which will be the future cross reference number used in WU metadata. Massive assumption made in that statement. But I believe it makes sense to have that version on board going forward. I do not suggest anyone take action until MSDEFCON rises, and Woody’s recommended action is described in his Computerworld article du mois. Win 7. All x4 WU installed, just fine. But then, I don’t run much on my PC, to generate conflicts. It appears so. I had the monthly rollup offered yesterday, but today I no longer see it. I do have KB3177467 installed, though I assume it’s v1 since it was installed October 2016. It disappeared from Windows Update on my Win 7 machine. I saw it there earlier in the week. OK so I had installed KB3177467 back on 12/27/06. September updates installed with no problem. Yesterday my WU showed KB4462923 and MSRT, both checked. Today my WU shows only MSRT, checked. So what am I suppose to do? Manually go to the Catalog and find KB3177467 v2 and install it before I get KB4462923 back? I recommend you WAIT until it is clear what is going on with the October patches. We are at DEFCON-1, which means DO NOT PATCH yet. It is still no clear wheat MS is doing with the October patches. Unless, of course, you LIKE finding the problems for the rest of us. What above two? I now only have MSRT showing. You don’t have any of the “except the two above,” so MSRT is the only thing you have from “all the updates except.” SO, if you clear it, KB4462923 will show up unchecked. On a test Windows 7 system. Was not offered the Oct rollup KB4462923. After hiding other windows updates, was offered KB3177467 as an unchecked and important update. There was no verbiage in the title or description of KB3177467 that this was a security update. If it wasn’t for Woody’s site I could have easily have hidden and forgotten about this update. KB3177467 was originally installed on this PC in 11/2016, but I decided to install KB3177467 v2 just in case or “just for sport” as Jan K would say:) I reran Windows Updates later this evening and am still not being offered the Oct rollup KB442923. Note this was done on a test machine. Woody is at Defcon 1, so this fyi only and is NOT advice for others to install anything. 2018-10-10 — Offered this morning by Microsoft. KB4457144 — 2018-09 Security Monthly Quality Rollup for Windows 7 for x64 based systems — has been offered in its place. I have checked all my machines and KB3177467, (the last Servicing Stack Update for Windows 7) was installed in October 2016. Does anyone know what is going on — Does MS know what is going on?????? All my computers are updated to December 2017.
so far MS has stopped offering KB4462923 thru WU, as I already ran WU scans on at least 3 computers running Win7 moments ago – on 1 computer it was offering KB4457144 on WU instead. Just received KB3177467 via WU by checking updates manually. I also checked yesterday and only got the .NET rollup. KB4462923 first appeared on Wed. in Windows Update, then it was gone on Thursday, now on Friday it is back but unchecked. What the h*** is going on? No one seems to have any answers. So, installing KB4462923 has unknown risks depending upon the system hardware and configuration. Also here in Germany KB4462923 is not offered via automatic updates! Previously KB3177467-v2 was installed via automatic updates, but KB4462923 is not offered! Here in the UK I got offerred KB3177467 via windows update, but after installing no sign of KB4462923. Rather worringly going to the Windows Update Catalogue and downloading KB4462923 manually results in the installation file getting stuck on “initializing”, so doesn’t get installed. Things haven’t settled out yet. MS is still “messing” with the patches. WAIT until the DEFCON number is 3 or above. There is no hurry to install anything yet. yup, KB4462923 is still not showing up on Windows Update as I checked after 10am today 10/12. So does the Defcon 1 apply to the Office, Outlook, Word, etc updates? Probably then safe for me to install the former, but think I will wait and watch for a while. Has Microsoft corrupted windows update on W7 by sending out KB3177467 V2 to consumers who already have V1 installed? It would be nice to know if the enterprise clients who already had V1 installed, also got V2 pushed out to them via their support services. V2 was released primarily because some system admins in the enterprise chose not to install a service stack update because it was not designated a security update. Hence SSU 2 being re-categorized as a security update. Both V1 and V2 have the same KB number. V2 does not over write V1. If both are installed, they will have a different version number. The question being asked is, should V1 be removed? It is a valid question that should be answered by Microsoft and not left up to the user (specifically the consumer). Microsoft should resolve it and not leave W7 vulnerable. KB3177467 is a service stack update, designated as a permanent update. Non-removable and uninstallable by users. The user can not uninstall a permanent update via the control panel. There is no uninstall button presented. Yes, I know there is a DISM command prompt that will remove an update from the windows update install list, but there is the risk that system files will remain when an permanent update is removed – this may corrupt windows update which could render it unusable (no more updates). Hacking the ‘mom file’ that comes with the msu is more effective and it requires specific cleanup commands be run afterwards. If you want to take the risk make sure you have a full system backup image in place before doing so. At this time, those who did the right thing (installed V1) are in the lurch. The ball is now in Microsoft’s court – will they play it properly or retire from the game. @anonymous: What does the V1 and V2 refer to? I must have missed that somewhere. I can visualize a “version 1”, and a “version 2” so hope that it what this means. Thank you for any clarification you can provide. @walker, you are correct v = version. Yesterday KB3177467 V2 was the only windows update in the queue on my W7/32 laptop. This morning it has gone – no longer offered. Pulled? I did install V1 back in September 2016, so maybe V2 was sent to me in error. The net update has returned and there are two new security updates sitting there are checked and important, KB3146706 and KB3153171. The important bit being “Fix for KB4462923”. This is like jack in the box. KB3177467 V2 disappeared from windows update today and 4 important recommended updates replaced it. The net update, 2 security updates and the MSE definitions update. After the MSE update auto installed itself all the other patches disappeared from windows update and KB3177467 V2 came back. It is currently the only update being offered to me right now. I have V1 of KB3177467 installed, but I cannot install V2 even manually, nor can I get offered kb4462923. After extracting and comparing all files in the old v1 and new v2 versions of KB3177467, I can confirm this. All of the servicing stack files in v2 are identical to v1 and have the same time stamps and calculated MD5 checksums. The .cat and .mum and .manifest files which are used for installing the servicing stack files have had their version number updated from 6.1.1.1 in v1 to 6.1.2.5 in v2. The release type in v1 was simply “Update”, whereas the release type in v2 was changed to “Security Update”. The upshot is that absolutely none of the v1 installed servicing stack files are updated at all. Yet the installed name for KB3177467 (as seen in Programs and Features >> View installed updates) changes from “Update for Microsoft Windows (KB3177467)” to “Security Update for Microsoft Windows (KB3177467)”. The name change appears to be important. I think that this name change is what Windows Update now looks for when deciding whether or not to display this month’s Rollups and perhaps all future Rollups. Finally, I note that v2 of KB3177467, just like v1 of KB3177467, is compatible with both Windows 7 SP1 and Windows 7 RTM since “_SP1” and “_RTM” sections are present in the file names and file contents of the .cat and .mum files. In other words, KB3177467 (v1 and v2) is backwards compatible with Windows 7 RTM and Windows 7 SP1 installation media. The upshot is that you can manually install this v2 update immediately after installing Windows 7, and before installing any other updates. In this scenario, a reboot will be required before you then check for and install other updates, since the original RTM or SP1 Windows Update servicing stack files will be updated. I plan to install KB3177467 v2 the next time I install or re-install Windows 7 in order to prevent the occasional hiccup or two which I encountered once or twice when installing updates to get the new Windows 7 installation up to date. You are totally safe to install KB3177467 v2. It appears that v2 being installed is going to be a requirement from now on with Windows Update. Yet since we are at Defcon 1, for the time being do not install the Monthly Rollup or the .NET Rollup until we get the “all clear” from Woody. I see that you have taken a very close look at KB3177467 V1 and V2 and compared them. I do not doubt your findings. The classification of this KB has changed and V2 is now a security update. From your post you assume that Microsoft will use V2 as the defacto standard when issuing future updates on W7 and that V1 will be ignored as long as V2 is installed. The problem is that we are expecting this ancient, mostly broken windows updates engine to figure this out. Please accept the fact that I am not trying to be difficult. Microsoft coughed up this fur ball, not you. You are trying to make sense of it. I understand that. I do not think that we can make definitive recommendations to the consumer at this point concerning V2. From my own experience I believe that Microsoft will communicate with the enterprise over the next few days as to what they should do concerning V2. It comes down to whether the enterprise goes ahead and installs V2 if they already have V1 installed. Those that do not have V1 will no doubt install V2 as they have nothing to loose. If Microsoft says that there will be dire consequences if V2 is not installed, even if they have V1 installed, they will schedule it. Otherwise, I can not see them going with V2. I also think that the enterprise will avoid (at all costs) having to manually remove V1 (they will tell Microsoft to take a hike on that). Further to my posting of October 13th at 6.44am I believe the installation was successful and believe me I am normally the pessimistic type. Before running KB4462923 from the Microsoft Catalog (X86 Win7) I ran a freeware program called Belarc Advisor which checks your computer for uninstalled Windows Updates amongst other things. I believe it mentioned three or four updates that needed to be installed, these updates formed part of KB4462923. After installing KB4462923 Belarc indicated that all my updates were up to date. I am confident in Belarc and although I have no association with the company.Its just (very) good freeware. I also made a syustem backup before and after instal so can go back to an earlier time if my suggestion wasn’t the solution. No clear answers here from users or Woody about the safety of this update. Seriously? I hate to go without security updates, but can’t find much info about the safety of this update here or searching the web. Seems to be a dropped subject here. The known issue you site has been there for the Win7 Rollups since March 2018. If you have been updating with Windows Update since then, and experienced no problem, you are probably safe from that issue. But KB4462923 may have been pulled, and at least its status changed from checked to unchecked so it doesn’t get installed automatically which indicates MS is not ready for it to installed . However, because of the DEFCON system, we do not recommend updating until the DEFCON number is 3 or greater (see top of page). That way, we continue to collect any problems the updates cause before giving the go-ahead for safe patching. Also refer to Susan Bradley’s Master Patch List. Just noticed the last updated value for KB4462923 has changed to 10/15/2018. It had been 10/11/2018. Haven’t compared the files yet to see what’s changed since last week. KB4462923 prevents our vSphere Client from connecting to our VMware ESXI 5.5 server indicating that it has a bad certificate, however a rollback of the patch allows successful connection. Reply To: Has Microsoft yanked last week’s Win7 Monthly Rollup, KB 4462923?